We took Eos to the slip in Olhão where we were met by the same friendly team as before and this year WiFi was added to the hospitality (whereas last year the office didn't even have an computer). 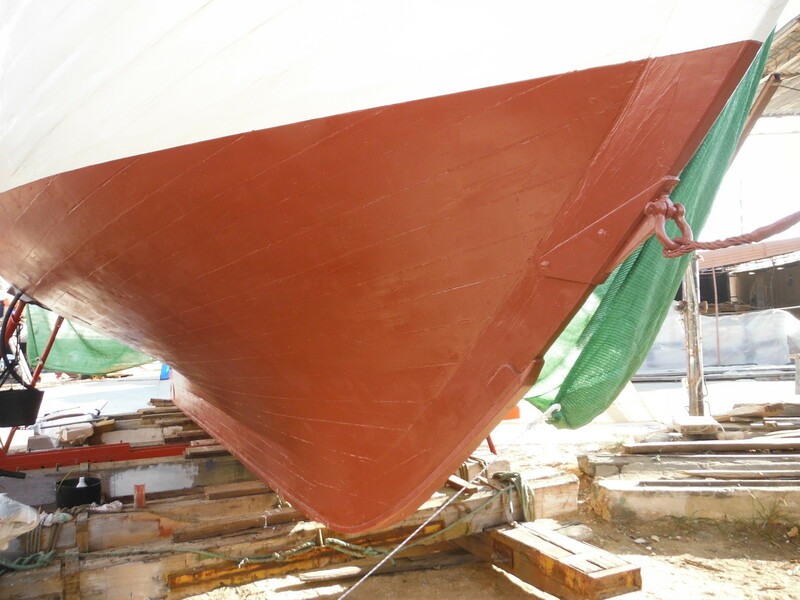 We knew there had to be some damage to the hull as Eos had been leaking a bit in the past months and now out of the water it indeed looked like we'd been hit by something, possibly by a big log during the flooding on the Guadiana. 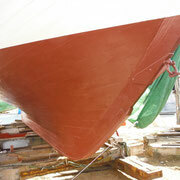 For the rest the hull looked in quite good condition. 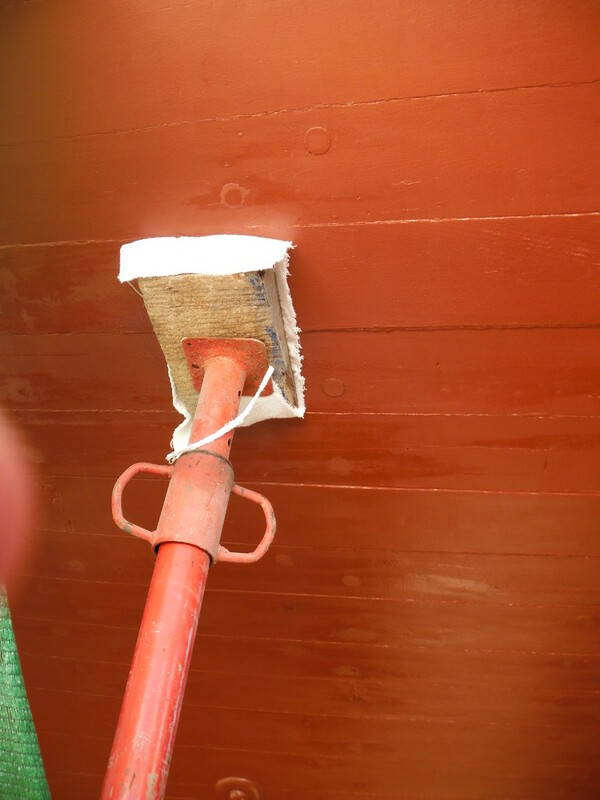 The layers of antifouling had become quite patchy over the years and we thought it might be a good idea to have all of the underwater paint stripped. So we did. Then the disappointments started. 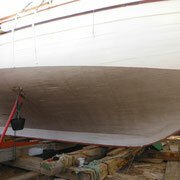 Because of the bitumen used in the seams, getting the hull bare took much longer than estimated. 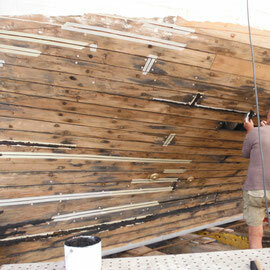 Then with all the planks clean, a few more showed having some damage and needing replacing. Oh well, better now than wondering later where the leaking's coming from. 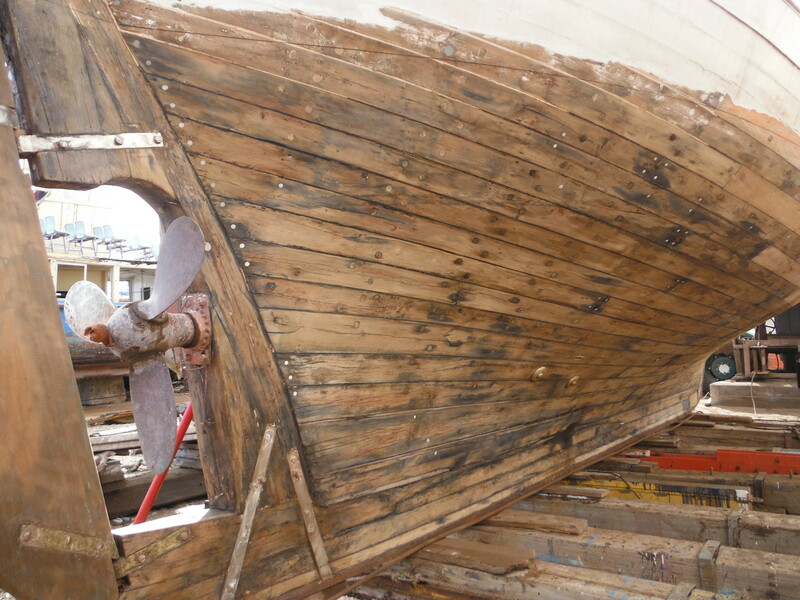 One of the planks to be replaced was down at bottom bilge level so I set to getting out all the water which is always left in the bilges after pumping out. 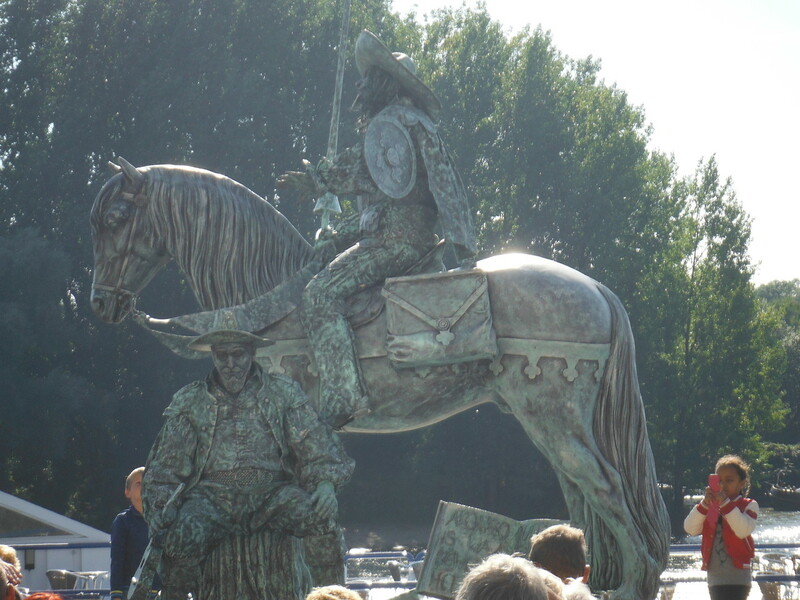 With a ladle attached to a stick and after that with a sponge attached to it, bit by bit all the dirty smelly muck was hauled up – backbraking! It was also a kind of treasure hunt lifting out the several nuts and bolts that had been dropped into the bilges over the years. 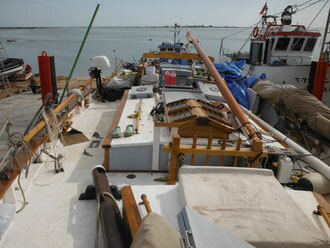 Some planks were taken out near the stern, so half of the aft cabin interior was out on deck. 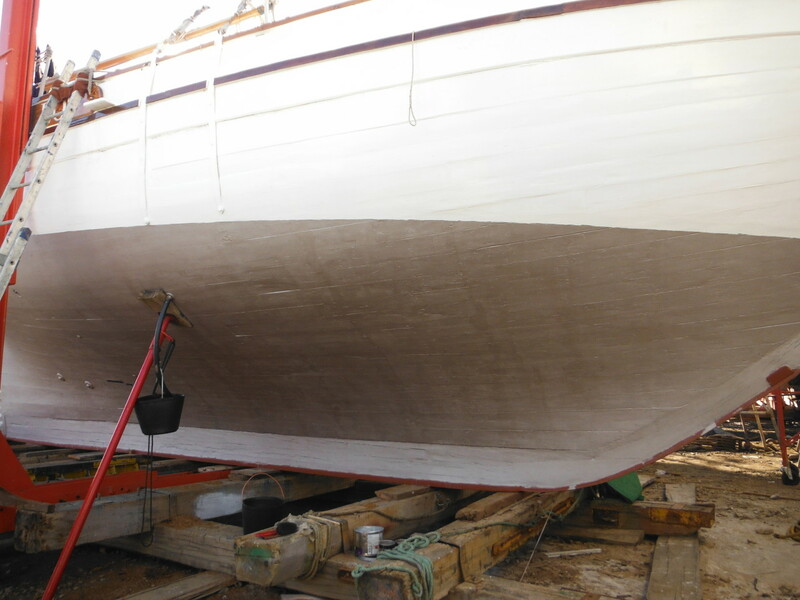 Within a week everything was coated with green dust from the sanding of the next door fishing boat, in the next week added by blue dust from the sanding of another neighbour. Panorama view from the deck. The island Armona in the distance and nearby a tiny nameless island where lots and lots of small boats row out to for cockle collecting every day. 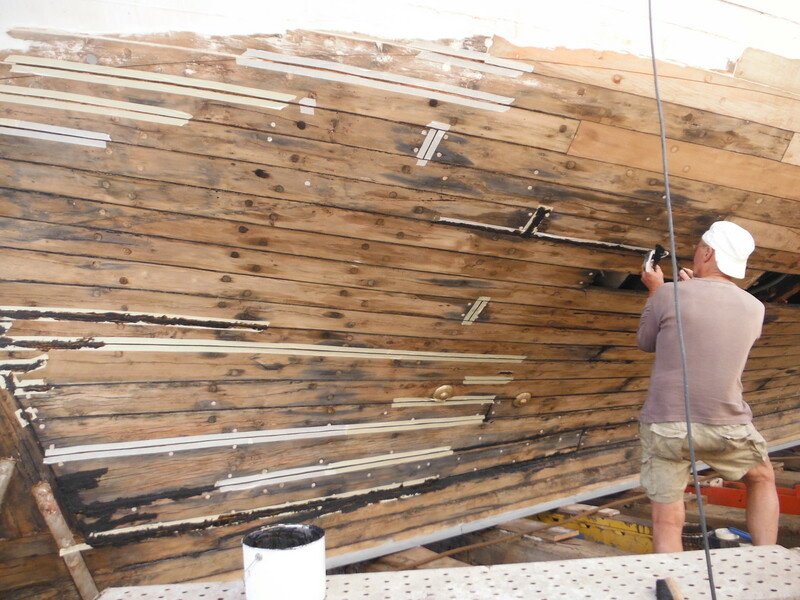 The yard carpenters did the scraping, planking and caulking, the mate did the taping and the captain filled the seams with bitumen. 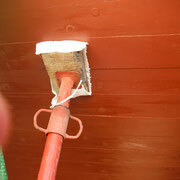 While on land, there are always some extra boat jobs besides just the antifouling. 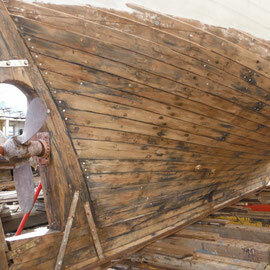 Having a good supply of wood, Peter made a proper floor in the engine room. Many hours were spent on internet trying to locate a new thermostat for the engine and we finally succeeded in finding a replacement, so that was put in – and while the heat exchanger was out it was easy to give it a new coat of paint and to improve the support. 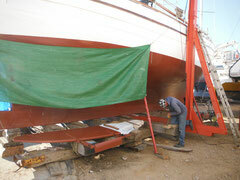 Some bits on deck were more convenient to varnish while on land instead of in the water. We took some fire extinguishers for a check-up (not needed by us, but by the Portuguese authorities). 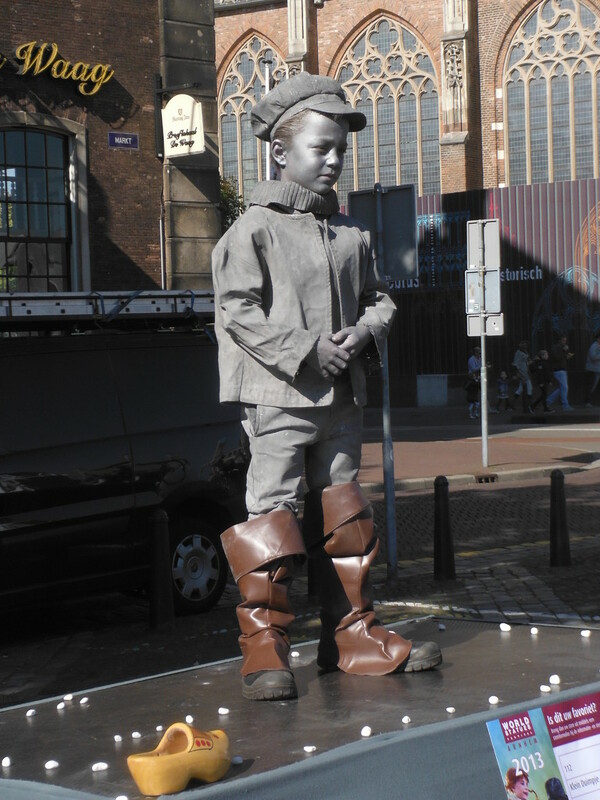 The windvane structure needed some adjusting, and so on. 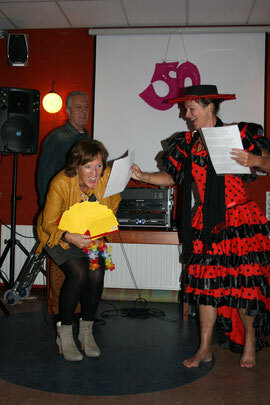 At her party there was a special performance by Elisa Marina from Andalucía. 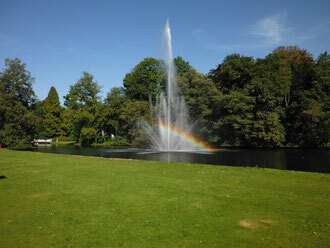 The weather was partly horribly grey but we also enjoyed some glorious sunny days. After the dryness of the Portuguese summer landscape we were struck by all the green. 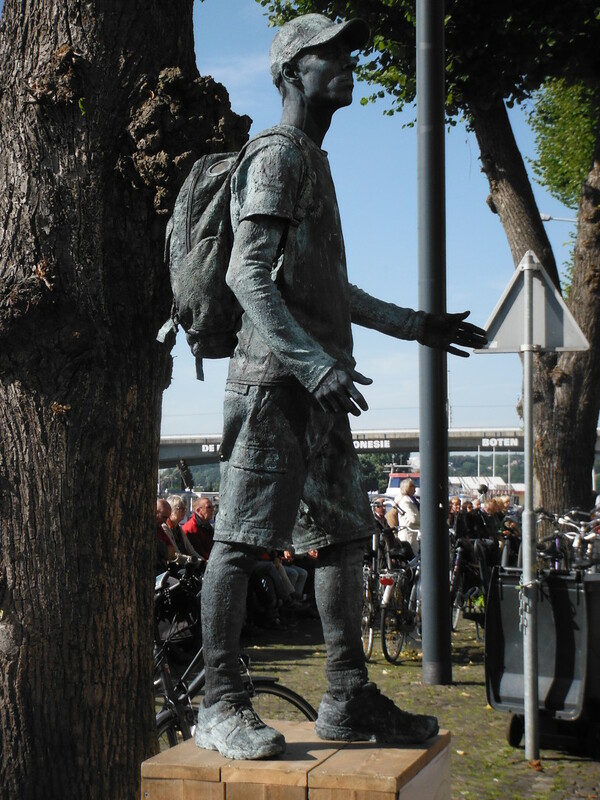 More of that in the next blog.